Tonights Tuesday Totter didn’t go quite to plan. Started by heading out to Greenwich via the Coldbath Egerton Drive route which entails crossing the railway over the Elverson Rd bridge, which I like to include now and again. Gives everyone a chance to practice their bike handling skills. Through the tunnel and out the other side, along the river, me trying to push it a little bit as I suspected the park path near Shadwell Basin might be closed. And indeed the keeper was just closing up as we arrived. So double back to the Highway. It’s not far to the turning back down to the Basin. However the road was really really busy and we had some less experienced folk with us. 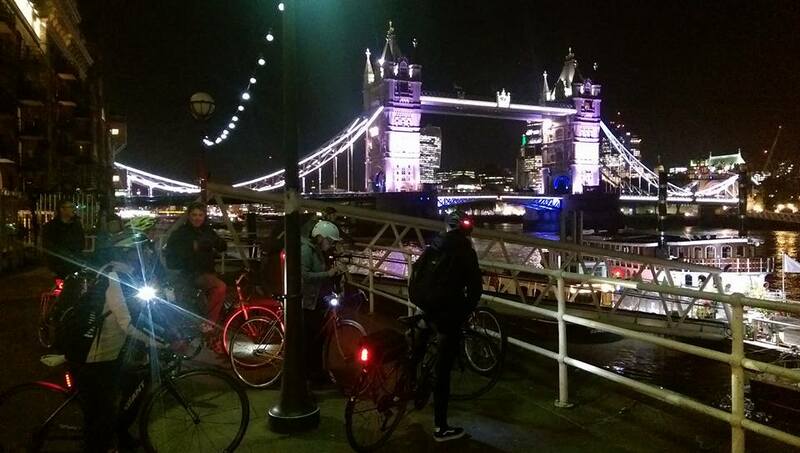 I was half planning to ride along the pavement and head down and then saw some folk were getting ready to ride on the road, so decided to change plans and head back to CS3 and use that to get to Tower Bridge. I had started to worry a bit, wondering if any other bits of the path might be closed and had visions of us wandering around Wapping Woods in the dark unable to get out! I decided to leave the Wapping Woods, Shadwell Basin and Ornamental Canal to another ride when I had fully checked what was and wasn’t open at night, and so we just rode along CS3, pretty busy even though it was way beyond rush hour by now. 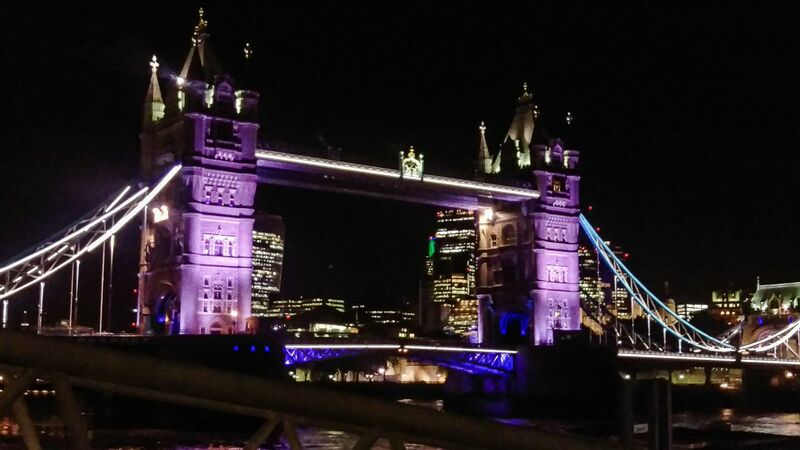 We decided to walk across Tower Bridge, which proved a bit of an experience. I had never realised till then how the Shard rears up behind the Tower in several different aspects as you walk past. Riding over the bridge I’m normally surrounded by motor traffic, wrapped up in it’s noise and stress , never looking up at the surroundings here. It was interesting to see this bit of the city from a tourists point of view. Nearly forgot one guy was joining us here, so phoned and waited for him on Shad Thames. Then just a short sprint to Bermondsey Wall and the Angel’s upstairs room where the conversation ranged somewhat erratically from anarchism to cycling caps, wielding guns in Saudi Arabia to battling with washing machines in Surbiton. All the while, the lights of Tower Bridge, and the dark shine of the wide river glinting down on us through the old wooden windows of the pub. We couldn’t quite decide on which way to go home, the river route was ditched (see what I did there?) at the last minute as beautiful but too long, and we headed over Jamaica Rd weaving our way around the back streets in search of Q1 so we could show it to one rider who hadn’t seen it yet. However, he left us just before we got on it! The rest of us rode along it happily. It was really busy with cyclists, even at this late hour. Millwall was lit up, in all its post evening match glory, empty and bright. As I rode along the path, I began to fall back in love with my city a little. I’m a South East Londoner through and through, but the last few years have seen my attachment tested. Watching vast swathes of public housing wiped out in just a few months and whole communities decanted to who knows where, seeing people forced to dish out most of their earnings to secure just a room to live in, seeing development companies with no understanding or affinity with the areas they are working in, wipe out decades if not centuries of history community and connection in just a few months, all this has made me feel like running for the hills, literally. However, tonight riding through Bermondsey and Deptford, I felt a little bit better about my home. So I opted to take the long route home, as a few of our group headed off Q1 to Peckham and New Cross, probably my quickest route too. But I stayed with the group heading for Folkestone Gardens, its pond glinting somewhat ominously beside us, foxes diving for cover in the bushes. Then, through Deptford to Broadway Fields and Brookmill Park, weaving along the narrow path, following the line of the Ravensbourne to emerge from the dimly lit park and riverside at Lewisham. Still noisy and busy, in contrast to the quiet darkness we had just enjoyed. Last goodbyes came a few streets later, as the final group split waving at each other as we weaved away, each to our own space in our own little corner of the city.